Classic Engraved Initial Cufflinks and Tie Clip Bar Set Alphabet Letter Formal Business Wedding Shirts S | What Should I Say? Blowout Sale! Save 82% on the Classic Engraved Initial Cufflinks and Tie Clip Bar Set Alphabet Letter Formal Business Wedding Shirts S by LOYALLOOK at What Should I Say?. MPN: TI082404-S. Hurry! Limited time offer. Offer valid only while supplies last. HIGH QUALITY MATERIAL -Made with stainless steel which is allergy free and does not readily corrode, rust, or stain with water.anti-tarnishing, scratch-resistant.Nickel and lead free.Never fade or turn your skin green. 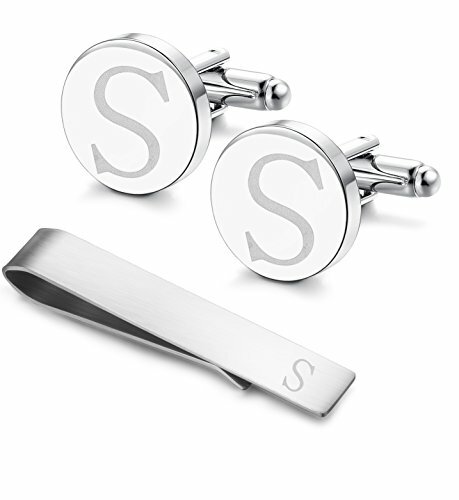 DURABLE&SPECIAL:Classic cufflinks and tie bar design with initial engraved on them.Shiny finish on cufflinks and matte finish on tie clip.They will add a sophisticated touch to his look. DELICATE AND COMFORTABLE TO WEAR -High polished by hands,the shiny mirror finish makes the cufflinks stunning.Decent-weight design.regular stainless steel closure is easy to put on and take off. PERFECT DAILY JEWELRY AND GIFT:A must have accessory for any wardrobe. Classic Initial Design,Stylish & Delicate for every men's Everyday Wear.Well boxed gift packing.Your family or friends will be happy to receive it as a gift from you.